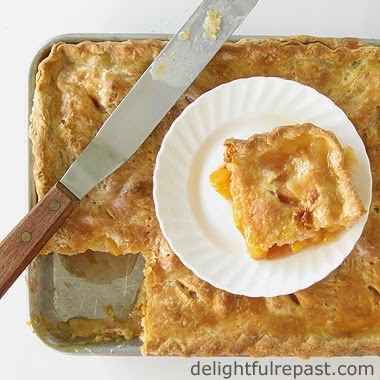 Peach pie is my all-time favorite pie, but I usually make a round Peach Pie with Lattice Crust. Today I was in the mood to make a slab pie, and the farmers market peaches were at the perfect stage for pie, perfectly ripe but still firm, their fragrance filling the kitchen. A quarter-sheet slab pie takes the same amount of filling and just slightly more pastry than my regular 9-inch pie, but gives more servings. If you're having an occasion where multiple desserts are served, you can cut even smaller servings -- not something you can do, neatly anyway, with a round pie. Perfect for picnics and potlucks! If you don't have tapioca flour, you can use cornstarch; but I don't recommend it. Unless you cook the peaches to death, the cornstarch can remain a little "starchy," in both flavor and mouthfeel. If you haven't tried tapioca flour (also called tapioca starch), I think you'll be pleased at the difference it will make in your pies. This pastry is a little different than my usual ones with water. Made with milk that's been soured with a little cider vinegar (or with buttermilk), it ensures a tender crust. It all started a few years ago when I had a little buttermilk left over from something and didn't want it to go to waste so used it instead of water in a pie crust I was making. Later I found that this substitute for buttermilk works just as well. What is your favorite pie? I like Peach Galette for Two when I'm trying to behave myself and not eat pie three times a day! 1 In 1-cup glass measure, stir together milk and vinegar; let stand while proceeding with pastry. In large bowl, whisk together flour and salt. With pastry cutter or fingertips, cut butter into flour, leaving some larger pieces. With a dinner fork, stir in the soured milk a little at a time, using only as much as necessary to form a shaggy dough. If you need additional liquid, just add cold water a teaspoon at a time. Divide the dough in two, and wrap each half in a square of plastic wrap, forming the dough into a 1-inch-thick disk. Refrigerate for 30 to 60 minutes. Save the pieces of plastic, you'll be using them again. 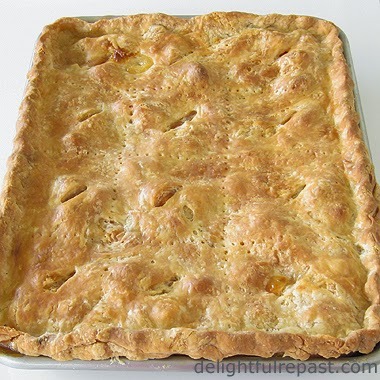 2 On a lightly floured piece of parchment, roll out one piece of dough to a 16x12-inch rectangle and transfer it to a cooking-sprayed 13x9x1-inch quarter-sheet pan, pressing dough (but not stretching it) to fit pie pan with about a one-inch overhang (trim with knife or scissors), cover with reserved pieces of plastic wrap and chill in the refrigerator. 3 Using the same piece of parchment, roll out the top crust just as for the bottom crust. Place it, parchment side down, on a 15x10x1-inch or half-sheet pan and place in refrigerator. Preheat oven to 375F/190C/Gas5. 4 Wash the peaches well and rub off the fuzz, no need to peel; slice into a large bowl (I use a 2-quart glass measure). You'll have about 6 cups of sliced peaches. (I slice them like this: Quarter peach, cut each quarter into 1/2-inch wedges, cut wedges in 1/2-inch pieces.) 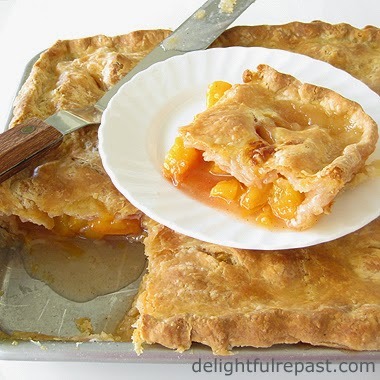 In a small bowl, whisk together sugar, tapioca flour (vastly superior to cornstarch or any other thickener for fruit pies), salt and spices; add to peaches and mix gently but well. Pour into pastry-lined pan. 5 Put top crust in place, trim and crimp. To vent the pie, I use a fork to make a pattern of holes and a very sharp paring knife to make some slashes. Place the pie in a 15x10x1-inch or half-sheet pan. Bake for about 55 minutes, until crust is golden brown and juices are bubbling. Cool on wire rack for at least 3 hours before serving. I cut this one much sooner. You can see the juices weren't quite cool enough. But bloggers have to get their photos! Maureen, thank you! Yes, I know *I* could live on pie, especially peach pie! Jean, my very favorite pie is peach, with lemon being a close runner up. I will take peach pie any way you want to make it. Love it! It's my very favorite, too, Judy. I'll be making dozens of these this summer AND freezing peaches for more pies after the season is over. Ghastly name, but photogenic. Slab pie – sounds like a banquet for birds of carrion. Buttermilk crust passes muster too. Still exploring “cooking peaches to death.” Might be the kinder thing to do. I mean, who wants to masticate peaches clinging to life, suffering from third-degree burns? That’s a candidate for an episode of “Criminal Minds,” possibly the most sadistic show on the air. You don’t think I’m overthinking this to you? I love to bake with stone fruits! Your peach pie looks stunning, Jean. Angie, thanks! Wish I had a piece of it right this minute! Mmm, your peach pie sounds delightful. I don't make a lot of "fruit" pies but I have made lots of cobblers. Pumpkin is probably at the top of my list as well as rhubarb, mincemeat and cream pies. My hubby likes his apple best. With ice cream of course! Thanks for sharing and joining me for tea. Sandi, thank you. I love all those pies you mentioned, though instead of a big mince pie I usually make tiny little English-style mince pies (tartlettes), which are perfect for the tea table. I like ice cream with pie, too, but try my custard sauce out on your hubby next time! Jacqueline, mmm ... pear and hazelnut pie sounds like something I'd like too! Oh and you're right ... "sheesh!" Jean I don't know whether to thank you or not....I've bee trying to decrease my sweets consumption--but damn girl--this looks and sounds delicious! I've always said buttermilk was my secret to soft bread but I've never tried it in pie crust. I can't stand peach fuzz so for me...they must be peeled. Peach pie is only second to my favorite, apricot pie. Where I live in Southern Oregon we have the most delicious peach I have ever had--49er peaches that ripen mid-August. They are firm, colorful and flavorful. Susan, they aren't fuzzy in the pie. Really, you rub the fuzz off when you wash them and dry them. Then when the pie is cooked, you not only don't notice the fuzz, you don't even notice the skin! Try it ONE time and see if I'm not right! I'm going to look into those 49er peaches; if they're as good as you say, I might have to do some traveling! True! I'm always delighted by peaches, Greg! Swathi, this is so much easier for me simply because I always have a quart of milk on hand but I don't always have yogurt or buttermilk. Thank you so much for commenting, tweeting and pinning--much appreciated! Bernideen, thank you! And best wishes in your retirement. Thanks, Nicole! Mmm ... I love apple pie, too. But as long as peaches (my favorite fruit) are in season, I have a hard time making any other kind of pie! Growing up my mom did this with apples and cherries. She called them pie squares. They were so yummy! I haven't made them in years. The peaches sound very yummy! Hi Jean! Wow your peach pie looks amazing and I bet it tastes delicious. Thanks for sharing this recipe! Thanks for stopping by and enjoy your weekend! Thanks so much, Julie! I love eating this pie for breakfast! Looks like another winner Jean! I haven't seen any peaches at the farmers markets yet, but I'm sure they'll be here soon. Serve warm with a scoop of ice cream! Yum. Thanks, Richard! I was amazed to see peaches at the farmers market so early. And they were really good, though I'm sure later ones will be even better. A slab pie would be perfect for one of our garden club meetings but I'll have to wait until late summer for our peaches to come in. Interesting about using buttermilk in the pie crust instead of water, I always have it on hand for the scones I make. This looks delicious. It seems when you reach my age, every food dish reminds me of someone special. My nephew (who is now 35) loved peach pie when he was little. He was so tiny but he could really put away the peach pie! Judith, it would be grand to attend one of your garden club meetings! Especially if there will be peach pie, scones and tea! Thank you, Mildred. I know what you mean; I associate food with people, too. And my Grandma said the same thing about me that you said about your nephew: "so tiny but s/he could really put away the peach pie!" Thank you, Stephanie. I hope you'll try it soon and let me know you liked it! Thanks, PP! Glad you like it. I'll check that out. Thanks, Linda! I share a lot of pies--I love pies! I am not a pie maker, but might have to try this delicious looking one! Thank you, Marigene! If you do, I hope you'll come back and let me know how it turned out for you. Jean, This sounds wonderful! I;ve been eating so many peaches, they seem extra good this season - in yogurt parfaits, it salads - I especially like to pair peaches with blueberries. Thanks for what promises to be a very good recipe! Carol, thanks so much! And do feel free to throw in some blueberries, I do sometimes! Now you've got me craving a yogurt parfait with peaches, blueberries and granola! Thank you, Pom Pom! You just made my day! I hope you'll try it soon. This looks fabulous! 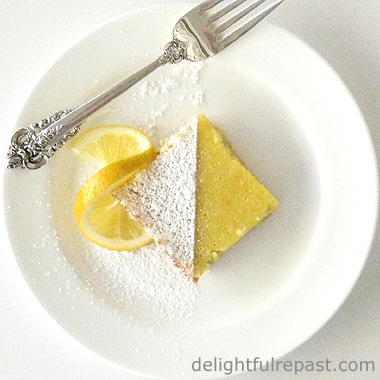 I like it;s tender looking buttermilk crust --yum! Thank you, Pat! Peaches are my favorite, so I'll be making lots of these through the summer. Oh dear me, I could go to a big piece of your slab pie right now, Jean! You share the best recipes! Kitty, thank you so much! I do love to cook and develop recipes. This is my kind of pie, it looks fabulous! Thanks so much for sharing your awesome post with Full Plate Thursday, I just pinned this recipe it looks so good! Hope you are having a great week and come back soon! Thank you, Miz Helen! I always think of my Southern grandma when I make this. April, thank you. I love it when one of my posts brings back lovely memories for someone. And thank you for the pins and tweets; much appreciated. YUM!! That looks delicious and easier than the normal pie!! Definitely one for the next potluck! Pinned it to try. Thank you, Jamie! Let me know how it turns out for you! I have plenty of fresh peaches coming I am going to have to try this. I've always wished I had a peach tree. Or, better yet, a neighbor with a peach tree!